If you want to go on a food binge, the best place to go is World Chicken! Yes, I might be a tad bias since their oh-so delicious pastas are my favorite, along with a number of side dishes like the decadent potato salad, but I am sure you will agree that they also offer a healthy concoction with their freshly-grilled chicken. It is a welcome break from all the thickly-coated fried chicken that most fast food chain offer. It has been ages since I’ve had my World Chicken meal and I am glad we had the chance to eat there when we went out to see a film and stroll in the mall the other day. We are sort of tired from the little man’s usual Chowking dining requests and since there are just a host of different options, we decided to give Trinoma’s food court a visit and chose World Chicken! My platter included a serving of the healthy grilled chicken, tuna fettucine, potato salad and a glass of thirst-quenching lemonade. Can you tell am already half-way through my meal when I took the photo? 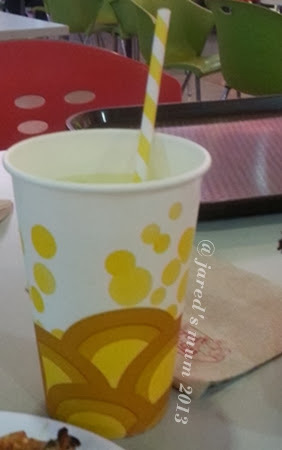 😛 I was also thrilled to notice that World Chicken is serving their beverages in cute paper cups with equally lovely paper straws! Kudos to them for lending a hand in helping to reduce the use of plastic! The little man was just slightly interested with the day’s meal and only had a few spoonfuls of chicken and pasta, and will not take a sip off the lemonade no matter how much we insisted that it is just as delicious as his favorite pineapple juice. He preoccupied himself by playing with the toy we brought along and listening to the piped-in music blaring from the food court’s music system. After the meal we then headed off to explore a bit of the mall, checking out lovely display here and there, like the nice Teenage Mutant Ninja Turtles action figures and this cool godin a6 at guitar center, and went to see the film Frozen, which is why we went there in the first place. 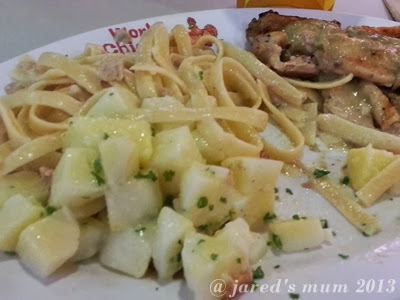 This entry was posted in food musings and tagged chicken, dining out on 5.December.2013 by admin. Chicken is one of our absolute faves! We probably eat fried chicken each week, or several times a week if we are on a roll! I know, it might be quite unhealthy, especially for my growing little man, but can we really help it? + if there were healthier alternative to fried chicken don’t you think we will be keen to try it out? This breakthrough chicken masterpiece was launched first at the Franchise Asia Philippines 2012 Expo held recently at the SMX Convention Center in Pasay City. The Stackers Burger Café Baked Fried Chicken is another food innovation from Bryan Tiu, founding owner of Teriyaki Boy before he sold 70% of the brand to the Pancake House Group in 2005. A prime restaurateur with several known food brands under his I-Foods, Inc., Tiu is at the helm of other homegrown brands like Tokyo Café, Peri-Peri Chicken and Kogi Bulgogi. The newest thing to ever happen to chicken, Stackers’ Baked Fried Chicken is Tiu’s latest take on the all-time Pinoy favorite. Mastered after months of careful research by the I-Foods Inc. research & development team, Stackers’ Baked Fried Chicken surprised all with 80% less oil so it’s lighter and healthier than the usual fast food fried chicken. A definite treat to the more health-conscious food lovers who just love their fried chicken. Dare to compare Stackers’ Baked Fried Chicken with your usual fastfood fried chicken and enjoy the healthier difference. In the Franchise Asia 2012, I-Foods, Inc. gave away complimentary Baked Fried Chicken gift certificates to expo attendees and other prospective franchisees in order to provide them with the opportunity to try out this new and exciting offering. Try this out-of-the-ordinary chicken delight available in all Stackers Burger Café outlets located at Eastwood City, Resorts World and McKinley Hill Venice Piazza in Bonifacio Global City, Alabang Town Center and also at its newly opened branch at the Promenade Mall in Greenhills, San Juan City. I-Foods Inc.’s other food retail brands include: Peri Peri Charcoal Chicken and Kogi Bulgogi. Tiu said opening possible franchise opportunities to business-minded individuals like himself will enable more Filipinos to enjoy his company’s pioneering and inventive food brands and its outstanding value offerings. For more details about the Stackers Burger Café’s Baked Fried Chicken + information on franchising, email ifoodsincfranchise@gmail.com or call 723-6033 or 09178779909. This entry was posted in food press and tagged chicken on 25.August.2012 by admin.